It’s been an exciting week in style, with the major runway shows wrapping up, including the inimitable Gucci show, and my friend Melanie getting published in an upscale lifestyle magazine, and me finding two Helmut Lang tee shirts at the thrift. I know, needing to breathe into a paper bag here! The beige and grey are not the problem; it’s the dictatorship over choice that I oppose, when style comes from within. That’s why it pains me to think of armchair fashionistas who lock their festive tights and paisley behind bars, fearing ridicule from the style police. When the triumph of rules comes at the expense of others’ creativity, it is not a win for anybody. 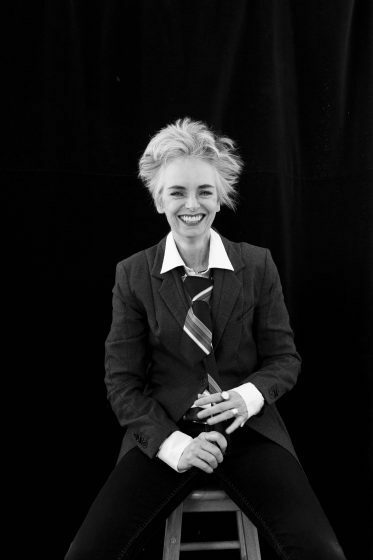 The author, wearing just what she loves that day. I do love this jacket; I’d like to DIY the lettering. This is a cute one for curly women. From the Halpern show, love. We had a good laugh at the head! We both started singing “with her head tucked underneath her arm…” a traditional old song about a beheaded queen here in the UK. I loved Melanie’s essay despite not relating to it at all. It’s possible to enjoy other women living loudly while not wanting to do it yourself and I think that if women ‘should’ do anything they should encourage and support each other. Melanie reminds me of Tilda Swinton only more fabulous. I’ve not got much experience being invisible though I can tell you stories about people who seem to resent tall women and will deliberately ignore them, as though my standing taller than those around me is some sort of obnoxious claim on something I don’t deserve. I have experienced that sort of invisibility no matter my age. The bottom line is that women deserve, as much as anyone, to be who they are and wear whatever they want to but there is a long tradition of telling women who they must be and what they cannot do. Some of us prefer to break the rules quietly and others want to shout it. I am celebrating both! 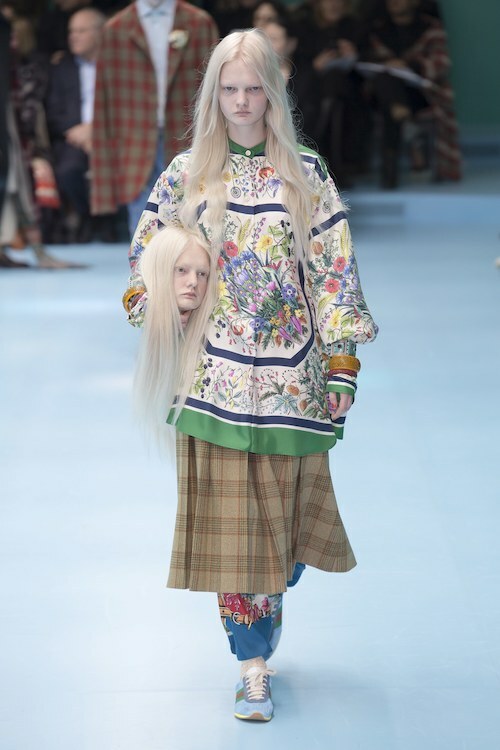 PS-Love the Gucci thing though I would find carrying around my spare head to be a bit of a nuisance. A stylish cross body bag to put it in would be good. I just read Melanie article and I think that is the way quite of us feel. Congratulations on the two Langs-I sincerely believe that FL does have some of the best thrifting. I thin HL might be pretty scarce around here. I spent the morning looking at Balenchiaga. I thought his show was solid. I am so glad that you highlighted Melanie’s article! I am just back from vacation and have yet to read it. That Gucci photograph is scary indeed. 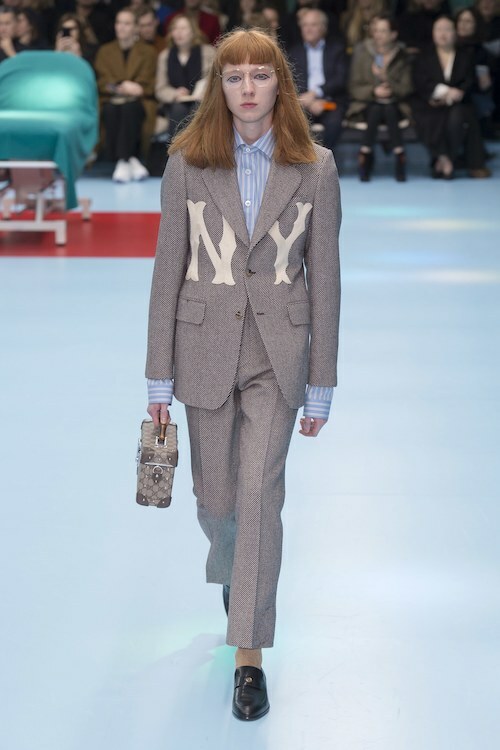 There is something about the Gucci adds this year that don’t sit well with me. I still love the clothing however. Love that turquoise brocaded suit! Swoon!! Thank you for including Melanie’s article in this post Patti. Thanks also for this scary peek at a few of the horrors emerging on recent runway shows. Art can be frightening. Some designers are clueless. I love Melanie’s essay and I support her ideas completely! I’m 45 and I want to age fabulously and have great fun with my life, doing things that I love the way I envision them, including style and fashion! Brava, Melanie! You inspire! I shared your article on my FB page. Thank you for sharing with us, Patti! Women like yourself are my role models. I so need a head bag. Hahaha!! “Don’t talk to the hand; talk to my head bag.” The runways have been quite wild this season; thanks for these photos. And of course, thank you for the shout-out about the article. I had a bajillion things to say so it was hard to write. Have a great weekend. Let’s put on those red shoes and dance. Gosh, that model holding the head is terrifying! What are they thinking? Why can’t models smile when they’re on the runway? I don’t get it. Happy Friday Patti! Bravo to Melanie! Thanks for bringing her to my attention! The catwalk shots are dreadful. And have you seen the trend of “ugly trainers”? I am all for wearing shoes that don’t deform our feet or keep us from walking quickly. But these bloated shoes are horrid.